Discussion in 'Samsung' started by JoeS, Feb 26, 2017. It's here! See also SurfaceProArtist's post or the press release. Samsung's next Windows 10 penabled hybrid comes in two flavors: 10" and 12", to be released later this year. Brief specs below, full spec table at the bottom of this post. 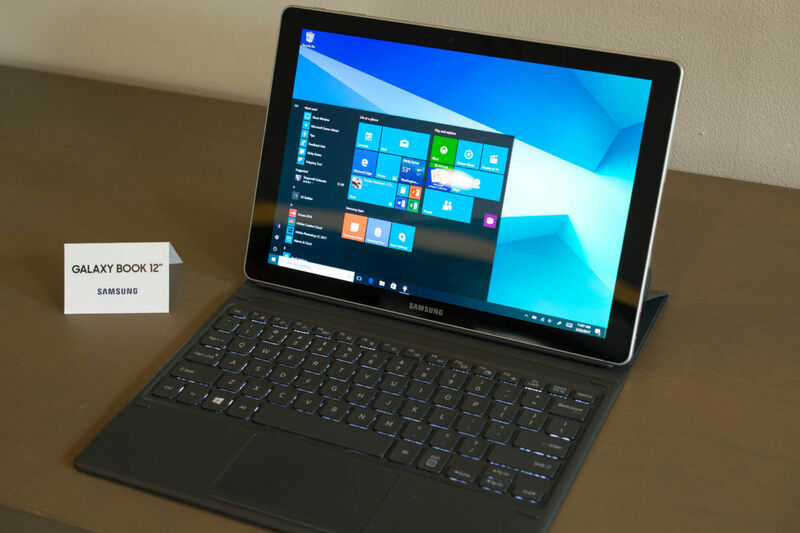 Samsung Galaxy Book Hands-On Preview from NotebookReview. siddhartth and alextrela182 like this. Two models. 10.6 and 12 inches. seems like a good candidate to be "surface 4/Air", especially the 10-inch model!! Aman and siddhartth like this. Looks good, but if SurfaceProArtist is right, the smaller version has a 10.6 TFT LCD, not AMOLED. I hope it's at least IPS. Edit: press release literally says TFT LCD with no mention of IPS curious about the screen quality. Or the brightness for that matter! The 12" i5-U is not fanless after all. Samsung just showed the insides with the fan. The 10in is so close to being perfect, but the lack of a kickstand, and only one USB-C port are a major bummer. I am also less than thrilled 128gb is the max, and the lack of a camera also can be seen as a con. Maybe this will kick others to bring out 10in devices with Core M cpu and digitizer. What was the battery size on the S3 again? Bit concerned with that myself....however cutting that corner could mean they deffinitly intend to make it quite affordable...maybe even in the under $500 range. Heck if they sell that 10-incher with keyboard for $399 at Best Buy...that would be a near instant purchase for me. On this side of the pond, there are reports that the 10.6" starts at 800 Euro (incl. tax) and the 12" is supposedly going for 1200-1400 Euro (incl. tax). Somewhat expensive. It will be released in Europe supposedly by mid-2017. Samsung Galaxy Book 12" - Is RAM upgrade possible? What issues have you had with the Samsung Galaxy Book 12?